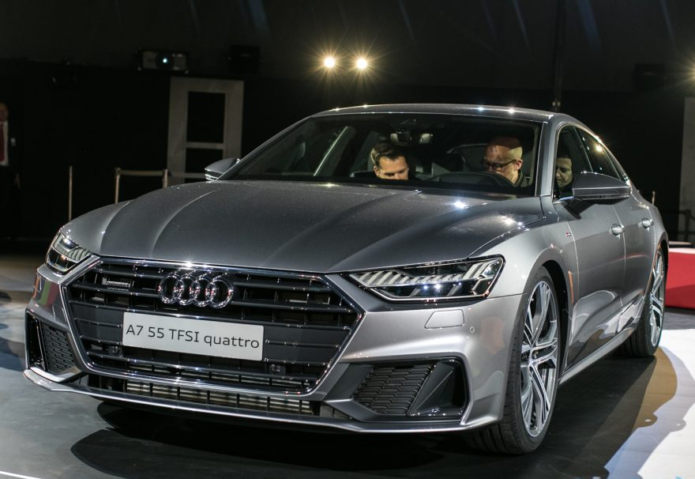 The new 2019 Audi A7 Sportback is an evolution, representing the automaker’s latest design language and the dramatic design elements of the Prologue concept car studies. The four-door coupe raises the bar in the luxury class when it comes to the new styling, digitalization, driving experience, and interior space. It’s a competitive segment, but Audi is confident the new A7 has what it takes. The Prologue study gave us an insight into the Audi design team’s vision of the marque’s future, and the new styling first went into production on the 2019 A8. The stand-out large surfaces, sharp edges, and strong athletic lines convey the A7’s dynamics and progressive design from every angle. The new Singleframe grill, wider and lower than that of the A8, along with the narrow headlights, contoured air inlets, and flat front help convey the sportiness of the A7. The headlights will be available in a few versions, but all have a tech twist to their design. The light signature follows the theme of digitalization: 12 adjacent lighting segments separated by narrow intervening spaces, which Audi says evoke associations with the binary digits 0 and 1. The top version is the HD Matrix LED headlights with Audi laser light. The long engine hood, long wheelbase, and short overhangs convey a strong and athletic stance. The pronounced contours emphasize the wheels, available in up to 21 inches, and reference Audi’s quattro genes. The A7 silhouette is defined by its distinctive roofline, which drops sharply toward the rear. Four figures delineate the sporty character of the extended coupe: It is 4,969 millimeters (16.3 ft) long, has a wheelbase of 2,926 millimeters (9.6 ft) and is 1,908 millimeters (6.3 ft) wide, but stands only 1,422 millimeters (4.7 ft) high. As with the previous model, the tapered rear end conveys the lines of a yacht. The luggage compartment lid ends in a pronounced curved lip and features an integrated spoiler which extends automatically at 75 mph. A flat light strip, a design common to all of Audi’s top models, joins the new tail lights. Those tail lights are made up of 13 vertical segments, which animate quickly when the doors are unlocked, and again when they are locked. Audi says the goal is to highlight the car’s dynamics, even when it’s standing still. Gone for this generation is much of the exterior chrome-work from the old car. You can take it even further with the optional black trim S line exterior package, with changes to the radiator grille and the front air inlets, the sills, and the front and rear diffusers. Overall, there are fifteen paint colors to choose between, eight of which are new. Audi’s designers know how to build an engaging cabin, and the A7 is no different. The new Sportback’s interior has echoes of a futuristic lounge, paring things back to emphasize space. The center console is oriented toward the driver, while all of the colors, upholstery materials, and inlays underscore the new aesthetic. Options include the design selection, the S line sport package, and the particularly pleasing Valcona leather, while optional contour ambient lighting runs LED strips around the dashboard and doors. The 10.1-inch MMI navigation plus upper display is tilted toward the driver. The screen, with its black panel optics and graphite gray frame, blends almost completely into the dash when it’s switched off. The body around the display itself is a geometric sculpture. The display’s user interface appears as soon as the car door is opened. In keeping with the tradition of the new minimal interior, the new MMI is also reduced and succinct. The new interior architecture melds seamlessly with Audi’s new MMI touch response. Gone is the rotary pushbutton and the conventional buttons and controls of the previous models. In their place are two large, high-resolution touch displays. As in the new A8, the driver controls the infotainment system from the upper display. Mounted below that, an 8.6-inch touchscreen provides access to the climate control, comfort functions, and text input. The positioning of the automatic transmission’s wide selector lever knob allows it to double as a wrist-rest. There’s an optional head-up display that projects important information onto the windshield, while the MMI navigation plus package also includes the Audi virtual cockpit with its own 12.3-inch display in front of the driver. MMI touch features haptic and acoustic feedback: you both hear and feel a click as confirmation when your finger triggers a function. The menu structure is notably flat, promising faster access to the core vehicle functions; it can also be personalized, thanks to configurable and movable favorites buttons. Optional voice control in the new A7 Sportback supports natural speech, with processing taking place both locally and – to boost accuracy – in the cloud. To do that, of course, the A7 has to be connected. As before, there’s 4G LTE baked in, with the A7 featuring the same infotainment and connectivity options as the Audi A8. Up to seven drivers can store their preferred settings in individual user profiles, and as many as 400 parameters can be personalized. The online services from Audi connect have been expanded, too. Additions include the traffic sign and hazard information Car-to-X services, which utilize the swarm intelligence of the Audi fleet to report on potential issues on the roads ahead. There is a choice of four sound systems. The top version, the Bang & Olufsen Advanced Sound System, also delivers 3D sound to the rear seats. With the AI button, you’ll be able to activate the Audi AI remote parking pilot and the Audi AI remote garage pilot, both of which will be made available at some point in 2018. These systems autonomously maneuver the A7 Sportback into and out of a parking space or garage. The driver can even get out of the car, before launching the feature via the myAudi app on their smartphone. While the car is smart, for liability purposes someone has to press and hold the Audi AI button the entire time the A7 is maneuvering. The central driver assistance controller (zFAS) merges the data from a sophisticated set of sensors to continually process an image of the surroundings. Depending on the equipment level, there can be as many as five radar sensors, five cameras, 12 ultrasonic sensors, and a laser scanner. Also under the Audi AI umbrella are a total of 39 driver assistance systems, split up into three packages. The Audi AI parking package (which will be gradually introduced beginning in 2018), the City assist package with the new crossing assist, and the Tour assist package. The latter includes such things as the efficiency assistant, which gives suggestions for a more economical driving style, and the adaptive driving assistant (ADA), which supplements the adaptive cruise control (ACC) with helpful steering interventions to maintain the lane. All driver assistance systems feature improved control mechanisms. With optional dynamic-all-wheel steering and a new electronic chassis program (ECP), Audi is promising both more sportiness and increased comfort in the A7. There’s an updated air suspension system which should make the car more agile, too, though still providing a smoother ride on long highway stretches. Progressive steering becomes more direct the further the wheel is turned. Aluminum fixed-caliper brakes with discs up to 15.7 inches in diameter are offered, and there are four suspension setups. The base car gets a conventional steel spring suspension, while options include sport suspension that lowers ride height by 10 millimeters (0.4 in), electronically controlled damping, and the self-leveling adaptive air suspension. Dynamic-all-wheel steering combines with a variable steering ratio, which varies based on speed between 9.5:1 and 16.5:1 using active steering at the front and rear axles. The rear wheels use a spindle drive that can turn them by as much as 5 degrees. At low speed, they steer counter to the front wheels to further increase the agility of the A7 when parking or driving in urban traffic, and Audi claims they can reduce the turning circle at full lock by 3.6 ft. At 37 mph and above, meanwhile, the rear axle steers in the same direction to increase straight-line stability and make for snappier lane changes. The optional sport differential improves handing even further. It actively distributes drive torque between the rear wheels, complementing the quattro all-wheel drive. As with dynamic-all-wheel steering, controlled damping, and the adaptive air suspension, the sport differential is integrated into the control function of the electronic chassis platform (ECP), all linked for a more cohesive drive experience. All of those settings respond to the Audi drive select system, which the automaker says now features a more pronounced difference between the comfort and sport profiles than in the previous model. All engines used in the A7 Sportback come as standard with a new mild hybrid system (MHEV), for both more comfort and an increase in efficiency. With the two V6 engines, this uses a 48-volt primary electrical system. A belt alternator starter (BAS) works together with a lithium-ion battery, recuperating up to 12 kW when braking. At speeds between 34–99 mph, the A7 can coast in its freewheeling mode, with the engine fully deactivated; it restarts in an instant thanks to the BAS. The start-stop function has also been expanded, and now activates at 13 mph. It’s also been integrated into the standard-fit front camera, too: the engine is restarted proactively, even though the car can be at a standstill, as soon as the vehicle ahead begins to move. In real-world driving, Audi says, the MHEV technology can reduce fuel consumption by up to 0.7 liters per 100 kilometers. The new Audi A7 Sportback will initially launch with the automaker’s 3.0 V6 TFSI engine. The V6 turbo produces 340 hp and 368.8 lb-ft of torque. That’s sufficient for a sprint from 0 to 62 mph in 5.3 seconds. There’s a reason Audi keeps pushing the Sportback design. Its argument is that it combines the best of all worlds, and is perfect for city and country driving: the design of a coupé, the spaciousness of a sedan, and the flexibility of an Avant, as Audi names its wagons. The interior features more space and more comfortable seating than before, most noticeably in rear knee room, which takes advantage of a 0.8-inch increase in interior length. Rear passengers also enjoy more headroom, while the loading width has also increased compared with the previous model, and now measures 3.4 ft.
seats with both ventilation and massage. At the back you can have either individual rear seats or a 2+1 bench. Other options include the air quality package, which not only has an ionizer and a combination filter, but offers a choice of perfumed scents. Instrumental to the comfort, quietness, and handling is the body, which features steel and aluminum composite construction. Large components, such as add-on parts, are made of aluminum, adding up to improved handling and greater comfort. The four-door coupe scores top marks concerning body stiffness, aeroacoustics and aerodynamics. Audi is promising a boost in acoustic comfort, too, while it claims the aerodynamics of the car will help minimize wind noise, too. If the LED lighting isn’t enough for you, a larger panoramic glass sunroof should allow more light in. An optional heated windshield, and wipers with integrated nozzles, promise to make dealing with winter a little easier, too. Despite the shape, the luggage compartment has a base capacity of 19 cubic feet. This increases to 49 cubic feet with the rear seats folded down, and Audi has redesigned the space so that two golf bags now fit horizontally. The optional sensor-controlled rear hatch opens and closes automatically in response to a foot motion under the bumper. The A7 has always been one of Audi’s most distinctive models, promising both sporting performance for driving enthusiasts along with the luxury motoring from the segment above. That’s a tough line to walk, especially in the face of growing competition, but Audi looks to have struck quite the balance of technology, speed, and a refined interior. We’ll reserve final judgement, of course, for when we can get behind the wheel ourselves. The new 2019 Audi A7 Sportback rolls off the assembly line at the automaker’s Neckarsulm site, and will launch in the US market in late 2018. Pricing will be confirmed closer to release.